The Fender Stratocaster is without doubt one of the most recognisable electric guitars in the universe. First born in 1954, the Stratocaster has often been used as the gauge for top quality electric tone. The 2017 American Professional Stratocaster fuses the best of both past and present Fender features to create an authentic, matured version of the original guitar. In order to construct a solid, comfortable Stratocaster body, Fender have employed alder tonewood, a firm favourite. The alder body is given a protective gloss polyurethane layer that enables both the colour and the original grains of the wood to shine through. A prominent feature of any Fender Stratocaster is the body's double cutaway shape. This facilitates total access to all the frets, even the higher registers. This body shape feels comfortable and very easy to wield. Firmly joined to the body is a smooth maple, 25.5 inch scale length neck shaped to a Modern "Deep C" profile. This new neck profile feels even more satisfying for the guitarist, improved by a satin urethane finish at the back. The neck is topped with a 9.5 inch radius rosewood fingerboard which plays host to 22 narrow-tall frets decorated with dot inlays. The space within each individual fret makes it easy to perform string bends and lay down chords with real accuracy and comfort. The Fender 2017 American Professional Stratocaster is equipped with three electrifying pickups. 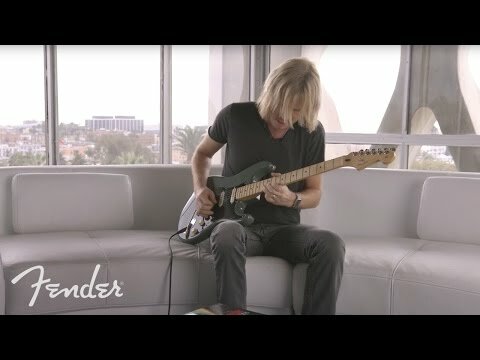 In the neck and middle positions, Fender have employed Tim Shaw's innovative yet vintage V-Mod Single-Coil Strat pickups for that unmistakable Fender Strat tone. These are accompanied by a Shawbucker 1 pickup in the bridge position which enrichens tone and adds another dimension to this Strat's sound. The pickups are all powered by a blend of Alnico magnets which are voiced individually to allow each pickup to portray their own character. The pickups are joined by a simple control interface which includes two tone control plus a Master Volume with a new treble-bleed circuit for a stunning sound output fuelled by a dual 250K/500K volume potentiometer. There is also a 5-way pickup switch blade to alternate between pickup combinations. Fender have fitted a 2-point synchronised tremolo bridge with bent steel saddles and a pop-in tremolo arm to enable you to create those wonderful diving, wailing tones heard by the most famous Fender players over the years. Tuning accuracy is well-upheld thanks to the standard cast/sealed staggered tuning machines and bone nut, while string spacing feels just right. The striking gloss body is complemented by a protective pickguard and nickel/chrome hardware. To protect your new pride and joy as best as possible, Fender supply an Elite molded case for storage or transport.